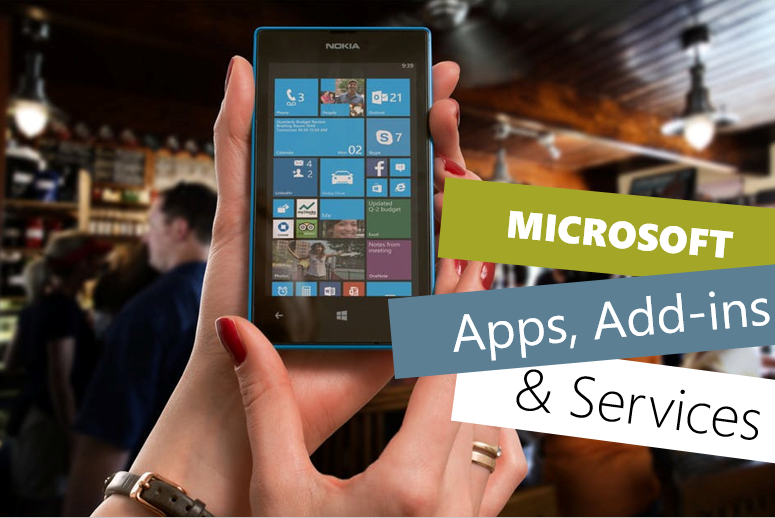 #Microsoft365 – Over the next month I’d like to take a walk through the apps and services available through Microsoft (as well as some noteworthy add-ins). These won’t be limited to Office 365 and I’ll try my best to give a layman’s terms as well as business case. Just making this list proved to be challenging. Creating an infographic which includes all the apps and services is not as easy as you’d think. A while back Kirsty McGratch came up with ‘the wheel’ in Office 365 – Isn’t it just Office in the Cloud?, and shortly after that Matt Wade created the ‘periodic table’ for An everyday intro to Office 365. They’re pretty neat – so give them a heads-up if you’d like to use them. I tried my best to make sense of it all and at least draw an infographic / diagram that I could use, but to no avail. We ended up having some fun when Darrel Webster did the ‘Tribute – Collaboration Diagram Parody‘ and I simply gave up and created a Tetris Game with the Office 365 Icons. I think I tried to say that if you pile up the apps too fast, you’ll lose the game and have zero user adoption. At least even when we struggle, we’re still having fun. Azure – Integrated cloud services that developers and IT professionals use to build, deploy, and manage applications through our global network of datacenters. Bookings – The online and mobile app that helps small businesses book and staff customer appointments. Connections – A simple-to-use email marketing service. Dynamics 365 – Capture new opportunities across your business when you bring people, data, and processes together with Microsoft Dynamics 365—intelligent cloud applications that unify CRM and ERP capabilities to help you run your business end to end. Flow – Automate tasks by integrating your favorite apps with Microsoft Flow. Make repetitive tasks easy with workflow automation. Forms – Create forms in minutes… Send forms to anyone… See results in real time. Invoicing – A new way to create professional invoices and get paid fast. Listings – An easy way to publish your business information on top sites. Microsoft Graph API – In the simplest terms Microsoft Graph is the easiest way to call the Microsoft APIs be it Users, Groups, Mail, Calendars, Contacts, Files etc. all from a single endpoint. This was previously known as the Office 365 Unified API. Microsoft MyAnalytics – Shows you how you spend your time so you can plan and schedule your time to work smarter and accomplish your goals. Newsfeed – The SharePoint Newsfeed app allows you to interact with your organization’s SharePoint social network while on the go. You can easily navigate your feeds and participate in conversations on your company feed or in the SharePoint sites you are following. Office 365 Groups – Office 365 Groups is a service developed with collaboration in mind. It works with the Office 365 tools you use already so you can collaborate with your teammates when writing documents, creating spreadsheets, working on project plans, scheduling meetings, or sending email. OneDrive for Business – Store, sync, and share work files in the cloud using Microsoft OneDrive for Business, which comes with SharePoint Online and Office 365 business subscription plans. Planner – Microsoft Planner brings together teams, tasks, documents, and conversations for better planning and collaboration. Power BI – See your company’s data in new ways with interactive data visualization BI tools from Microsoft Power BI. PowerApps – Transform your business by creating custom business apps with Microsoft PowerApps. Connect data from the cloud and make your own app—no coding required. Project Online – is a flexible online solution for project portfolio management (PPM) and everyday work. SharePoint Online – SharePoint is used by organisations to create websites. You can use SharePoint as a secure place to store, organise, share and access information from almost any device. Skype for Business – Skype for Business lets you collaborate with anyone, anywhere, on any device, with the security and control of Microsoft. Stream – A new business video service that makes it easier to access and discover video content inside your organization. Sway – Create and share interactive reports, presentations, personal stories, and more. Sway is an easy-to-use digital storytelling app for creating interactive reports. Teams – Microsoft Teams is an entirely new experience that brings together people, conversations and content—along with the tools that teams need—so they can easily collaborate to achieve more. To-Do – Microsoft To-Do comes from the team behind the Wunderlist app, and delivers a smarter, more personal and intuitive way to help people stay organized and get the most out of every day. Visio Online – Industry-leading diagramming and visualization solution. Yammer – Connect with people and teams across your organization. Make better decisions, faster. See you tomorrow when I’ll take a look at Azure.